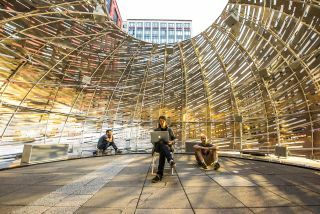 Inside NASA's Orbit Pavilion, creators (l to r) David Delgado, Shane Myrbeck and Dan Goods. NEW YORK - At the World Science Festival, running through Sunday here, NASA debuted the "NASA Orbit Pavilion." The exhibit's metal enclosure looks something like a spiral seashell and offers an auditory experience inspired by NASA's Earth-watching satellites. "Most people don't know that NASA studies the Earth," said Dan Goods, a NASA visual strategist who helped create the Orbit Pavilion. "It's good to do Earth science from space, because you get a global view." Students outside the NASA Orbit Pavilion at the World Science Festival in New York City. During a five-minute presentation, visitors enter the curved metal structure and are immediately aware of calming sounds, like waves crashing and crickets chirping. The sounds come from all directions, but they each seem to be moving — gliding from one end of the dome to the other on different paths. These sounds represent each of the 20 active NASA Earth satellites passing overhead. A network of speakers creates the "movement" of the sounds. The presentation changes gears when a presenter reminds the attendees that these satellites must be launched into space; then the speakers play the sound of a rocket taking off. The sound moves across curve of the ceiling, giving a realistic impression of movement. Then the calming sounds return. Toward the end of the program, a voice calls out the names of NASA satellites currently studying the Earth, as well as a few other orbiting laboratories, including the International Space Station. The location from which the voices come is the actual, up-to-date location of each of those satellites in the sky. NASA's Orbit Pavilion, an auditory encounter with the NASA satellites that study Earth, at the World Science Festival in New York City. Three of the exhibit creators, including Goods, spoke with Space.com about the project, and said that because sound can't travel in space, the satellites don't actually make any noises. But the creators had the idea to represent the movement of the satellites with sound, rather than images, and offer an alternative way of thinking about all the NASA Earth satellites moving around above everyone's heads. "We like to call it 'sneaking up on learning,'" said David Delgado, an artist, designer and educator at NASA's Jet Propulsion Laboratory who worked on the Orbit Pavilion, in reference to the types of projects he and his colleagues put together. Last year, Delgado helped create an art piece inspired by the Rosetta mission that studied comet 67P/Churyumov–Gerasimenko. "We plant the seeds of curiosity with people, and when they leave they want to know more." You can find out more about the World Science Festival here. Follow Calla Cofield @callacofield.Follow us @Spacedotcom, Facebook and Google+. Original article on Space.com.